I don't remember things always at first. I just don't. You can jog my memory and then sometimes I do, and it's great! But sometimes I don't. But Macy, I do remember. She's a Slaton girl. A pretty Slaton girl. And her dad, Troy used to stop by and visit at our video store "back in the day" and come in a talk about her and her brother, Traylor. Even before they were old enough to work there. And then, when they were old enough, WATCH OUT. Traylor was INSANELY fun and crazy and his sister, Macy? STUNNING. Seriously? This girl was on every Taco Villa advertisement for miles and miles and it wasn't because she loved bean + cheese burritos, even if she did! LOL She's simply beautiful. She married Carlyle, a Cooper boy after years of being in love. 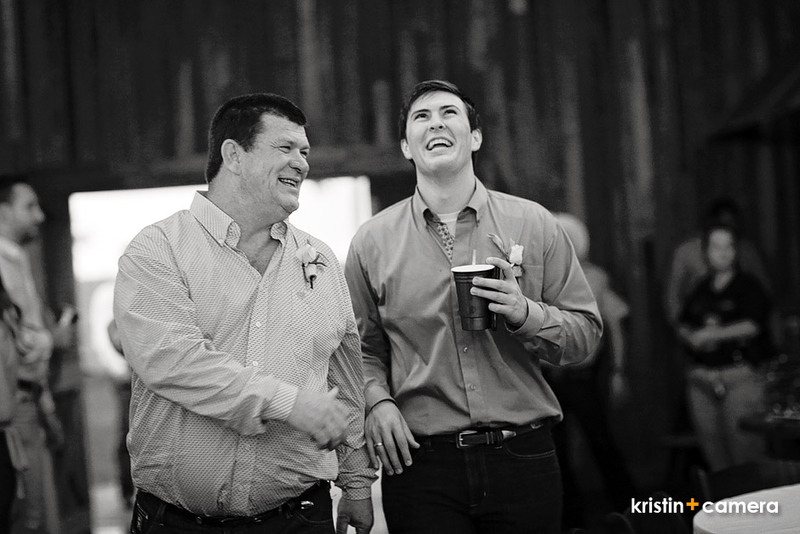 During the reception, Carlyle's Dad gave a heartfelt speech that had me in tears, but even more, it moved his son to break down as well. He spoke about how beautiful Carlyle thought Macy was. How he talked about her with his dad when they first met and started dating. How his dad knew by the way he talked about her, that "this was the one". We've had some crazy West Texas storms lately, and even though they had their hearts set on marrying at Cotton Creek out by a gorgeous HUGE tree, they moved the wedding indoors. There was just too much rain. Why chance it? And it did rain. LOTS. And the wind blew, and the electricity even went out, briefly, like twice. But that didn't stop the joy and laughter and love from filling that old barn full!!! 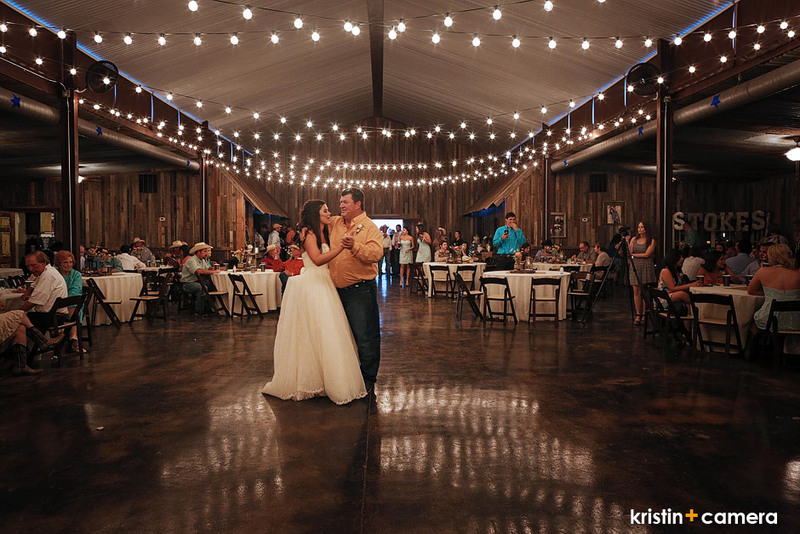 We danced and celebrated the two of the them in lovely West Texas style! Thank you, Macy + Carlyle for being so dang cute and loving each other in such a fun way. Thank you for showing your feelings openly with each other and for trusting me to document them. 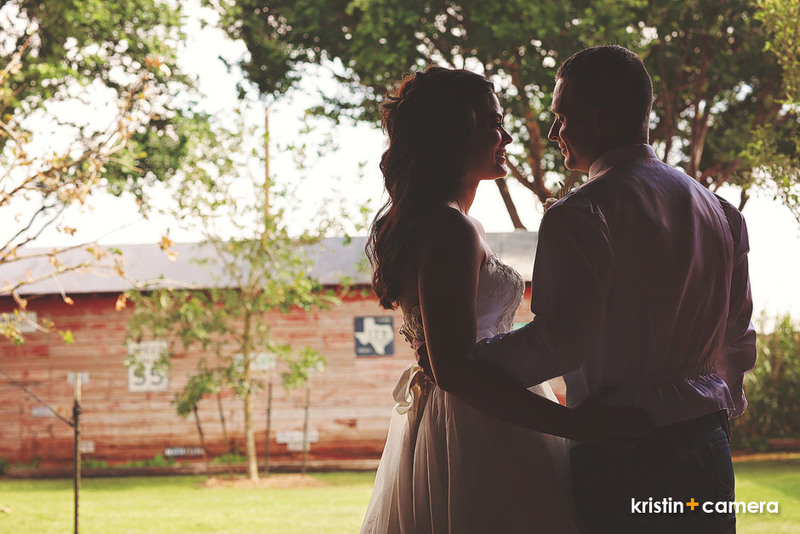 I so enjoyed photographing your love story! Gorgeous lace on the bride's veil! I haven't shared her bridal portraits yet, but they are definitely a must see! Cotton Creek has a groom's cabin and bride's cabin on opposite corners of each other, so there's no chance they can see each other unless they want to. I found the grooms hanging out trying to keep cool. I did manage to drag them out for a few pictures. Look at these fine boys all dressed up in their cowboy best! I found Macy in her cowgirl best chatting things over with her girls. This picture above of mom just cracks me up! 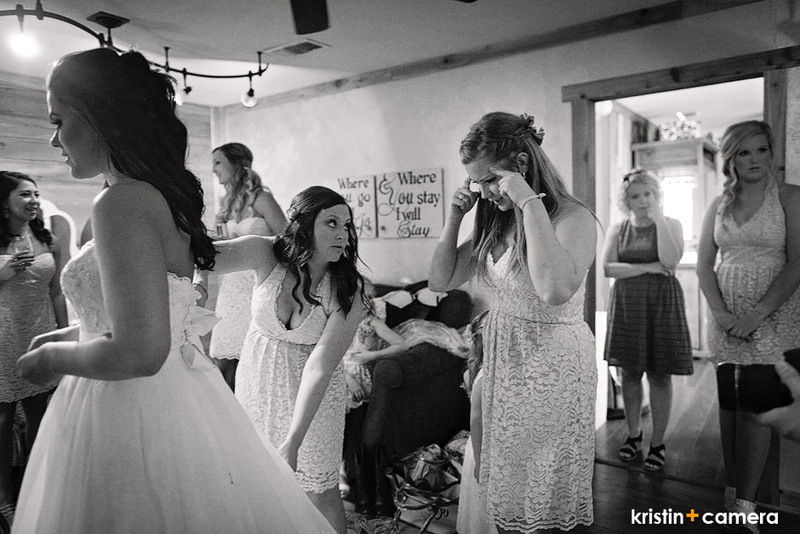 There's always so much going on in a bride's room and people are just plain fun. And then of Kambry below? Macy's train bustled for some serious dancing and Kambry was taking a "mental picture" of just how that worked. Too funny! Weddings at Cotton Creek always turn out AWESOME! I love having all the nooks and crannies to make beautiful pictures. 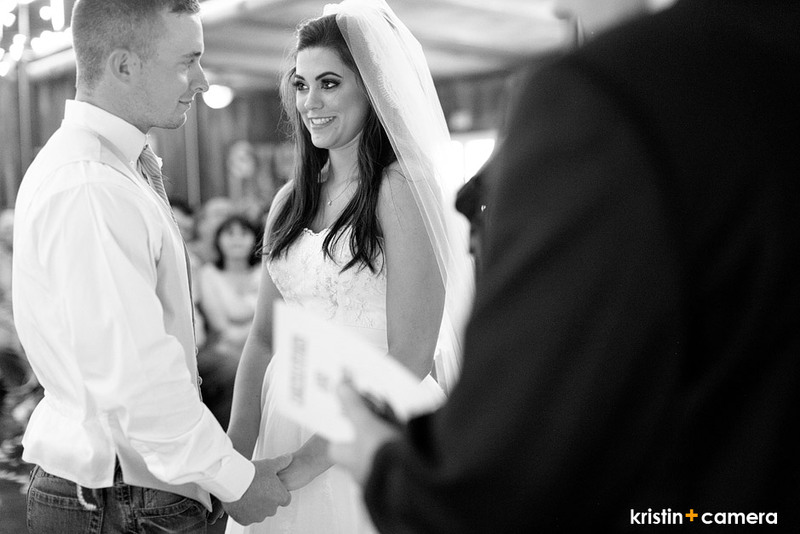 The couple choose to see each other before, a "First Look" perhaps, and it turned out so dang sweet! Macy had to back up and start over a couple of times before she could compose herself. And then they were both grinning from ear to ear! And of course, that part I talked about above? You know, being emotionally open to each other and just enjoying their day? YES. TEARS!!! Such a great moment! I love how they both just nestle in each other's necks! We spent some time making some gorgeous images of just the two of them! Cotton Creek is sooooo good for this. HELLO! Pretty barn. All set up and ready for the "I Do's"! A quick check of the makeup and we are GO TIME! I blogged this shot below before, but it's worth repeating. This sweet girl, Kolby, I think that's her name. She recited a Macy + Carlyle Fairytale before the wedding began. She totally CRUSHED it! Great moment! They were both just so happy! After kisses, the reception started shortly with a first dance. Then we cheered with good toasts and even a tear or two, followed by food and more dancing! Not to mention some cake fun. I mean, HELLO! I'm sure they made up later. 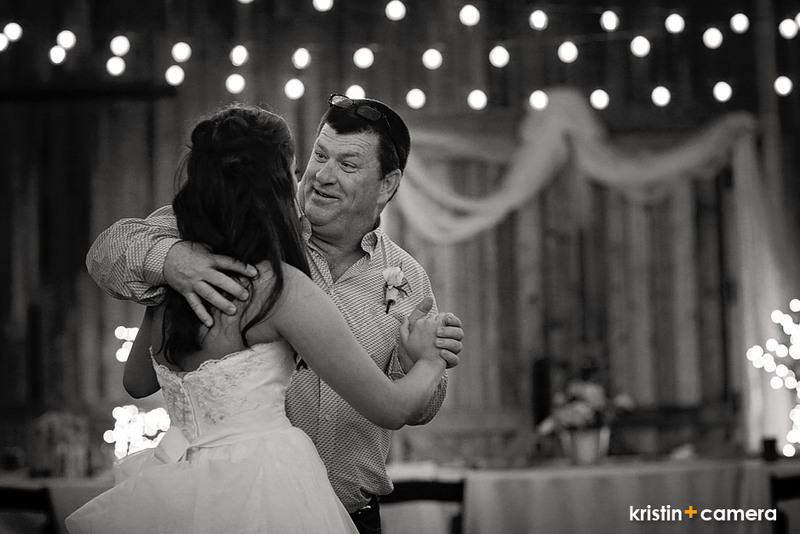 And then, Macy danced with her Dad, Troy. I loved watching them chat along and just enjoy the moment. And they weren't the only ones enjoying the moment. 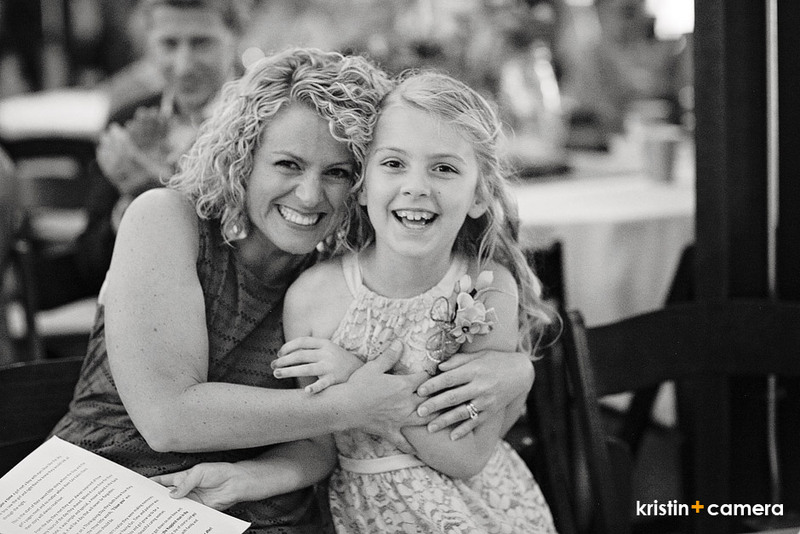 This little one hit the dance floor a time or two. See how pretty this place is for a country, elegant wedding? I have no idea what they were discussing, but they sure were enjoying their selves. All in all, it was a beautiful night for a lovely couple! Congratulations you two!!! MUCH HAPPINESS! !